The story of how I discovered La Muerte is also the story of how I became involved with PJAMM cycling. About a year ago in December of 2018, I found out from my school that I had been accepted into a program to study abroad in Cuenca, Ecuador at the beginning of the next year. Knowing that there was no way I was going to go two months without rtraining, I immediately decided that I would be bringing my bike with me down to Ecuador, and began looking into what the riding was like in the area. During my research into the cycling situation around Cuenca, I stumbled across a relatively nearby Strava segment simply called “la muerte” (which translates to “the death” in spanish) that absolutely blew me away. The segment was 44 miles long, with 12,242ft of climbing! I had never seen another climb like it in my life. This insane segment seemed even more daunting when I saw that only 13 people had ever finished the full climb on Strava. The second I saw this segment I knew that there was no way I was going to live about 2hrs from the start of the climb for 2 months and not give it a shot, so I set out to learn as much as I could about the ride and what I would need to be prepared for it. During this process of gathering information on the climb, I commented on the Strava activity of the last person to have ridden up La Muerte asking about the road conditions and what suggestions he had for the ride. 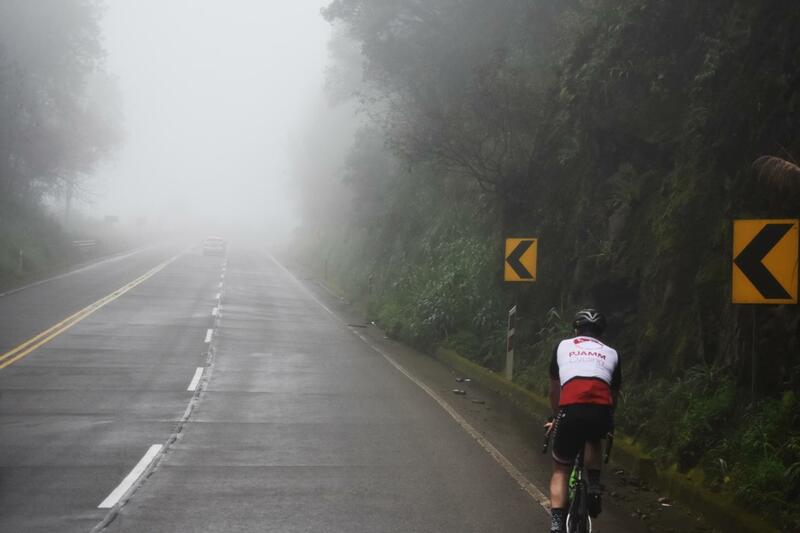 A few months later, when I was finally in Ecuador, John from PJAMM commented on that same activity of the last person to ride La Muerte asking for info about the ride and saying that it looked like a climb that would rank really high on his site. I saw this comment and reached out to John to let him know that I was planning on riding La Muerte in the coming weeks, and that’s how myinvolvement with PJAMM began. There’s a saying out there that says something along the lines of “man plans, God laughs”, and there have been few other times in my life where that saying was as accurate as the day that I rode up La Muerte. Because I am an overconfident 21 year old male, I had decided that I was going to try to beat the current KOM on the La Muerte Strava segment, which was 5hrs and 21min. I was in really good shape, and after planning things out for many weeks in advance, I was confident that I had thought of everything that I needed to be ready to do my fastest possible time on the climb. Nutrition, pacing, hydration, I was certain I had everything dialed in. On the morning of the big day, the driver who I had hired to take me to the start of the climb and follow me up the mountain picked me up along with my photographer roommate Max, who I had convinced to come along to take photos and help me document the climb. The 2hr drive from Cuenca to the start of the climb involves driving to the top of the mountain where La Muerte finishes, and then descending down the road to where it starts at the base of the mountain, and we spent the entire drive talking about how lucky we had gotten with the weather. You see, the weather in the mountains around La Muerte is notorious with locals for how impossible it is to predict and how quickly it can change, and the entire drive to the start we had blue skies with just a couple of clouds, so we were excited that we had lucked out. A fuzzy shot from the drive to the start of the climb. The road can be seen just over the guardrail. Notice the calm blue sky. There is a service station located just a few hundred yards from the start of the Strava segment, so we parked there to get all set up for the ride. Because I had a driver, and Max to help out, I was fortunate enough to be able to leave all of my food, water, and warm clothes in the truck that was following me up the “hill”. The plan was for the driver and Max to trail me up the road with the truck’s hazard lights on with Max taking pictures, and then anytime I needed food or water, I could wave them up and Max would hand me a bottle or some food out of the car. After talking with Max and the driver about my plans to not stop riding until the end of the climb, I saddled up and hit the road. The second I started pedaling up the mountain, the weather flipped a hard 180 degrees and things started to get gross quickly. It was as if the mountain itself had heard us discussing how nice the weather was that morning and said “Sike! You thought you had lucked out?” Super thick fog started to roll in, and rain and wind started to pick up. The temperature at the start of the ride was about 88 degrees fahrenheit, so the wind and rain weren’t freezing, but the moisture in the air combined with the humidity and the fog, was pretty brutal. Despite the thickening fog and slowly increasing rain and wind, I was feeling really good at the start of the climb. Because I had been training in Cuenca at an elevation of 8,500ft for the past 2 months, I knew that I would be feeling really strong at such a lower altitude, so I had strict power number that I was going to pace myself by. I settled in to the effort and began steadily working my way up the climb. With a climb that was expecting to take me over 5hrs of non-stop ride time, I knew that nutrition was incredibly important, so I made sure to go through one bottle of water every 40min and to get something to eat from Max whenever he handed me a new bottle. Max and I had talked for a few days about the incredible shots of the surrounding scenery he would be able to take while I rode, so it was a huge bummer that by about an hour into the ride, the fog was so thick that we couldn’t see anything but maybe 50ft of the road in front of us. The next hour of riding featured more of the same, with me getting food and water from the car, and Max trying to get some cool pictures despite the extremely limited visibility and ever increasing rain and wind. After having to sprint away from a pack of stray dogs (not a fun thing to do 2.5hrs into a 5hr effort), the weather got to the point that I told Max, who had been hanging out in the bed of the truck to take photos, to get in the cab to get out of the rain and to protect his camera. It’s not a ride in South America unless you have to sprint away from some dogs! With the weather to the point that we could barely see cars coming down the mountain in the opposite direction (Ecuadorian drivers seem to be REALLY against driving with their headlights on, even with only about 20ft of visibility), the day turned into even more challenging ordeal. With nothing to focus on as I rode but the fog in front of me, I just slowly watched the elevation reading on my bike computer tick up. As the rode became even more wet, it even got to the point where I “crashed” twice because my tires lost traction on the slick road, causing me to slide out and fall over. After roughly 3.5hrs of consistent 7-9% grades, I finally began to understand why this climb was ranked as the third hardest in the world. By this point, the only thing that kept me motivated was the 2 mile descent waiting for me once I got to about 9,100ft, however I was definitely not in my right mind, because between the pouring rain on the sleek roads, and the terrible visibility from the fog, the descent would prove to be the most stressful part of the whole ride. Despite the truly awful weather, up until the descent, I was still feeling strong. I was following my pacing plan really well, and it felt like an effort I’d be able to sustain for the remainder of the ride. However, after not pedaling at all as I navigated my way down the sketchy descent, when I started to climb back up again, things started to turn sour fast. I had thought that I had been eating enough the whole ride, but with a climb this long, one small mistake can have some pretty serious repercussions. At about 31 miles in to the climb, with 9,500ft of climbing done thus far, I started to hit a wall, hard. My power began to drop drastically, and I slowly grew more and more out of it. After grinding it out for a few more miles and about 1,000 more feet of climbing, I started to have some serious issues. I began to black out a little bit, and was slowly slipping into delirium, unable to control my bike and swerving sketchily all over the road. At 34.7 miles, I regained awareness while sitting on the side of the wet road and watching Max and my driver load my bike in to the back of the truck. Apparently I had pulled over to the side of the road and pulled the plug on the day, but I did not remember stopping. I then proceeded to vomit a few times before crawling into the passenger seat of the truck to get driven home. At the end of the day, I had ended the climb with 10 miles still to go, but I had still done 34 miles and 10,500ft of climbing. If the fact that I had to bail with 22% of the mileage of the climb left to go, but still finished with 10,500ft of elevation gain doesn’t help you understand how much of a challenge La Muerte is, I don’t know what will. Between some of the worst weather I have ever ridden in, and the relentless gradient, La Muerte was hands down the hardest ride I have ever done. There is no doubt in my mind that this is one of the hardest climbs in the entire world. Despite the awful weather and the worst implosion of my life, I’d do this climb again in a heartbeat. Truly a climb with few equals.